The age-old problem of lacklustre streaming services on smart TVs may be coming to an end, in the UK at least. 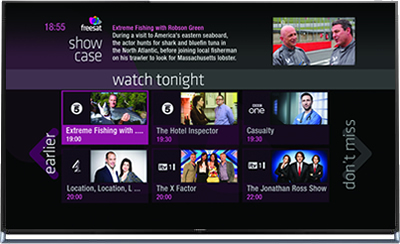 Panasonic have struck a deal to integrate the Freesat Freetime rollback service into new models of its Viera smart TVs. The Freesat Freetime TV guide and catch-up on-demand TV services was launched back in 2012 and now accounts for 40% of all freesat boxes. The service contains a TV guide that rolls backwards 7 days (just like YouView), and offers viewers access to the catch-up services from the top UK broadcasting networks including the BBC iPlayer, ITV Player, 4oD and Demand 5. The service will come built-in to the 2014 range of Panasonic VIERA TVs, whether they use an antenna or sa satellite to receive signals. Discovering streaming television can be a nightmare, especially for those who are unsure of what they are looking for. Sure, if you already have a favorite show you might have better success at using the wide-variety of services available–but for those looking for something new? It can often be a struggle. When looking for an app or software that was going solve this seemingly never-ending issue, no one ever thought that the solution would be coming from TV Guide. The company, which is helping to bridge the cord-cutting with cable and satellite television world, is implementing a new hook to its existing TV Guide platform. So how does it all work? And what makes it easier to use? Simply put, it takes all of the information you are searching for and puts it in one spot. That means not only will you be displayed information on when a show will be broadcast on standard cable television, but you will also be provided with a slew of streaming options and even on-demand opportunities to view the content. You can even do a search for shows based on likes, or by an artist or actor name. Then simply add these shows to your “Watchlist” and the app automatically creates a tracker for your interests. The app, which launched yesterday, is free with ad-support, and is already off to a great start. That is not to say it’s perfect, but with a few weeks of data behind them the developers should be able to turn this into a media powerhouse. Until a more viable option is available, the newly refreshed TV Guide app is your best bet to keeping your sanity while looking for television streaming opportunities and more. Zeebox, the social TV app that launched last year in the United Kingdom is preparing for a launch in the United States–and they are doing so with a massive backer. The company, which created the app to help users find and discover content by seeing what other people think of television shows in real time, will bring the app to a new set of users in North America. Analysts believe that a partnership with cable giant, Comcast is imminent. Zeebox’s CEO has gone on record via email to state that many partners will be a part of a launch in the United States. The app which launched last year, is a consumer-facing app designed to create social discovery of television shows, and tap into the massive popularity of social networking–in addition to providing bonus content like clips, reviews, and information about cast and crew. “We are very much looking forward to our US Launch, which I’m pleased to confirm is imminent. We will be working with a range of great US Partners who all share a deep appreciation for our work,” Zeebox CEO Ernesto Schmitt said in an emailed statement. A partnership with Comcast is what has most analysts buzzing. With a unique and intuitive tool like Zeebox infused with Comcast’s already powerhouse like electronic program guide that helps users find content, it can only strengthen their position as a leader in cable television and social interaction. Other analysts believe that Zeebox and Time Warner have been trying to put a deal together for quite some time now, however, if done it would in no way compete with a partnership involving Comcast. 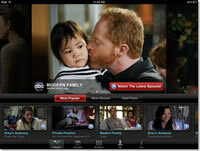 Zeebox wants to create a universal app that is used no matter how content is served to a television screen. Earlier this year Zeebox partnered with MIG (Mobile Interactive Group) to integrate an in-app purchasing and voting system to their software. 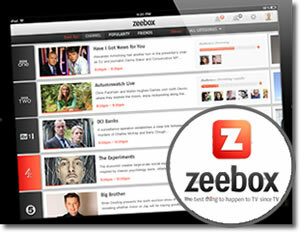 No announcement date has been set for the launch of Zeebox in the US. Is there room in the world for another online TV guide? New start-up Fav.tv obviously think so as they have gone and released one. 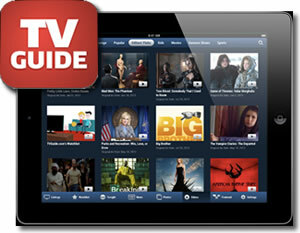 Their interactive TV guide can be accessed online or as an app on Android and iPhone. The service does the usual stuff such as see TV listings, set-up reminders and access more information on shows etc. The service also has the now obligatory social services with Twitter and Facebook comments and likes. “You shouldn’t have to live by someone else’s schedule or try to keep up with online chatter when watching your favourite shows. We just want to create a better experience for people who love TV,” said co-founder and CEO Saverio Mondelli. fav.tv seems to have high expectations of the guide that has taken 2 years to develop from a simple iPhone app. Wouldnt it be great to just type in the name of the latest movie and get to see the plot synopsis, movie details, trailers and even links to the full movie? Well stop dreaming, this feature is here and is avalable on our movies and TV shows page of worldtvpc.com. Type in a movie name into the search box on this page and you will be presented with the plot outline of the movie and movie quotes. The cast information, trivia and lots more. If you would rather watch the movie then either click on the trailer links or scroll down to see information on all available movie streams on the internet. Hope you like the new movie search feature and dont forget we are adding new free tv websites to our database all the time which means new sources for the movie streams. Watching TV streamed from the internet started as soon as computers became powerful enough to show video, and broadband connections became quick enough to move all that data around. Luckily things have improved from what started as jerky, slow and low quality video streams. Now you can find it everywhere, and due to the explosion in streaming TV, movies and video, many experts predict that streaming video on-demand content will inevitably soon become the standard. The analogue signals of old are now long gone, and have been replaced with instantly available digital streaming content that offers a breadth of choice never seen before. The process of watching TV using your either your computer or any number of connected devices such as tablets, smartphones, streaming media boxes and smart TV sets, is now the best way to watch TV. It brings convenience, and access to an almost unlimited supply of content. So, for the uninitiated, we explain what internet TV is all about and how you can get access to all those great movies and shows. The first thing you will need to watch TV over the internet is a ‘connected device’ and a broadband connection, dial up just doesn’t cut it, and for mobile devices, 3G is not really good enough for stutter free streaming, so get a fast Wi-Fi connection, or a newer 4G mobile account. The faster your connection, the better, faster and higher quality streams you can watch. 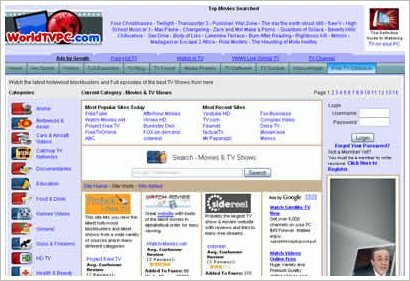 There are a number of websites that link to TV channels online streams. Many of these streams come from well known sites such as 24 hour news channels like ABC News, shopping channels such as QVC etc. But any good stuff from these well known channels are generally available on paid services or from their own catch-up websites online (see below). There are also lots of totally unheard of channels on the internet thanks to the low cost of creating your own channel. All you need is a webcam and a Youtube account. You can find a large selection of free channels on the web, they do tend to be shopping/news/music/chat shows, and even specialist/obscure channels such as BMX biking, pottery etc. These channels tend to be low budget and do not have any premium content as a rule. Check out our Internet TV section for examples of the kind of channel available. You can browse the streams as they are sorted by categories and into individual Countries. 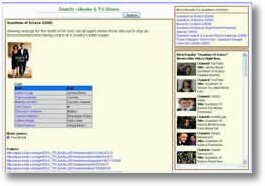 Before you start watching these ‘Internet TV channels’ you may need a to install a couple of free media players, but many may already be installed on your computer. If not, they can easily be downloaded from the internet. Windows Media Player, Flash Player, Apple’s Quicktime, and Silverlight are the most common. However, different websites use different media players, so you may need to download them all to take advantage of all the content that is available to watch online. We have a page to download the latest media players. Pros – Free to watch channels, hundreds of different streams, running 24 hours per day, large choice and selection. Cons – Many channels loop same content over and over, some content very dated, no premium stuff to watch, Loading times can be long depending on server, many streams stop working. If your going to watch TV on your computer or connected device live or in ‘real time’ then the data has to be sent to your PC over the internet quickly enough so you can watch without any hold ups. If your connection isn’t up to it and cannot stream the video quick enough, the end result will be freezing screen, buffering, and patchy viewing quality whilst your computer waits for parts of the program to load up. However if you download this content to your hard drive it doesn’t have this problem as you download the entire video file before you start viewing. The downside with this is that some video files are very large so if your broadband connection is on the slow side, you could be waiting for hours or even days to get it onto your hard drive! These big files can also use up any broadband package allowance if you have it. You need to keep an eye on how much you are downloading as a single episode of a top TV show will use up several hundred megs of your data allowance. To find and download a movie or TV episode you have a couple of options. You can use a pay service such as iTunes or Google’s Play Store, and after paying the file gets downloaded to your hard drive, smartphone or tablet. The other option is to download a p2p software package then search for your movie or show and start downloading. Once its done you can access straight from your hard drive anytime even when your offline. You can also use Torrent clients to download which is similar to P2P but a little more complicated. Please note – Downloading any movie, tv show or music using a P2P or torrent site will in most cases be illegal in your Country. Please be aware of your local laws and act accordingly. To watch the latest TV shows and programs on TV, you can either go to the official TV networks website. 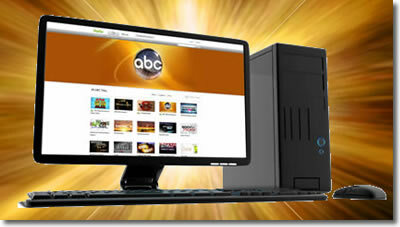 Websites exist for all major networks around the world such as ABC. the BBC or NBC etc. Once there, just find a link to the streaming or catch-up area and search for the show you want to watch online. Most sites nowadays have a catch up list, you can visit our catch up TV section to find your local network. The downside with this method is that many networks will only allow you to watch the show if your in the right country and for a limited time. So to watch the American networks you need to be in the USA. You will get a message of this when you try to watch, and it will be based on your your computers IP address. There are ways around this, but they are all far from perfect. Pros – Free to watch the latest shows and movies, catch up on missed shows, many allow you to download for offline viewing. Cons – Content is Country restricted, content only available for 7-30 days after airing, full seasons not available. There are a number of websites that claim you can watch the latest streaming TV and movies as soon as they are released. These websites are somewhat dodgy though and are slowing getting smaller and smaller as big search engines such as Google take action on piracy. Lots of the streams are hosted on now busted servers such as those from Magavideo and Megaupload. A lot of these websites also make you download a virus infested piece of software, have pop-ups aplenty or make you perform an action before letting you get to the stream in question, which may then not exist anyway. The many downsides of using this method and the legality of it means it is not something we would recommend. Find some of these sites in our Movie and TV show websites. Pros – You can watch the latest and even unreleased movies and shows, free, full seasons can be found. Cons – Illegal, unsavory advertising or viruses lurk on these sites, many scam and bogus sites that do not have the content they promise, many lead to paid products, Loading times can be very slow. So if you want to legally watch the latest content, hit shows and top movies then you will have to pay. Pay TV websites fall into two categories, subscription services and pay-to-view. 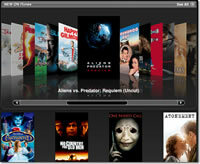 Anyone with an iTunes account can head over to iTunes and pay to rent or own (download) a movie. Android users have the Google Play store and anyone else can use a number of services such as Blinkbox, Vudu and Amazon Instant amongst others. These services allow you to rent or own a virtual copy of the movie, show or even entire season. You can then by logging into your account watch and download on any number of connected devices. Pros – Rent or buy the latest shows and movies with no commitment and get a massive choice. You can also download to your computer, tablet or phone for quick rendering. Cons – Can work out expensive as usually priced similar to a DVD rental. Plenty of choice in the streaming subscription arena, dominated by heavyweights Netflix, Amazon Prime and Hulu Plus. These services have thousands of titles which you can stream an unlimited number of times for a monthly fee. Costs are usually in the $8 per month range. Because of the low cost and number of titles, the content tends to be of the older variety, and don’t expect to see any current TV shows for a year or so. Pros – Watch unlimited streaming on computer, handheld device, smart television or games console. Very low cost compared to Pay-TV services and wide choice. No commitment and can cancel at any time. Cons – Choice somewhat limited and older content usually made available. Have to pay extra for the latest releases, and no option to download to your devices. Note – It is now easier to find any title from either subscription or pay-to-view services by making use of one of the many aggregation websites that have sprung up. We have compiled a list of content aggregation websites here. For many people, watching streaming content means they can cancel expensive Pay TV subscriptions to cable and satellite networks. This is known in the trade as ‘Cutting the Cord’. Viewers can find their fill of movies, shows, kids shows, news and sports events. The downside is that not all cable content is available online until some time after airing. But the upside is that the content is available at anytime and on-demand. Cord cutting has also led to viewers watching complete seasons of shows in one sitting, or watching a bunch of movie sequels in a watchathon session. This ‘Binge viewing’ phenomena is something you cannot get with standard Pay TV and appeals to many. To find out if cord cutting is for you read our complete guide to cutting the cord. You can watch video files from your home network as well as web based streaming for free using media center software. The biggest and most popular is XBMC which started life as an Xbox piece of coding. This software is free and runs on pretty much every device. It also gives you access to many add-ons which include plenty of live TV channels as well as the latest movies and TV shows. An alternative to XBMC is Plex which is based on the same software but is preferred by some. Watching streaming content on a computer can limit it’s appeal. So if you want to watch your streaming on a big screen TV then you can look at the different connection options. Simply connecting a HDMI lead from PC to TV is the easieast, but there are also many options to stream, mirror or cast content from your connected device to the big screen. Look at our different wireless streaming options here. You can find more useful information on streaming by reading our in-depth streaming website reviews, and check out more internet TV guides and tutorials here. Please come back as we add more info and enjoy the world of internet TV and dont forget, we will always have the latest in online TV developments and news here on worldtvpc.